Providing you the best range of fully automatic vibro finishing machine, paint coated vibro finishing machine, vibro finishing machine, vibratory finishing machine, metal finishing machine and metal polishing finishing machine with effective & timely delivery. 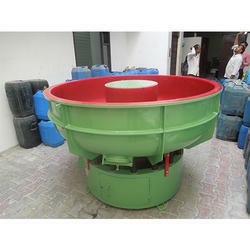 Vibratory Finishing Machine made available by us finds application for meeting the demands of work cell de-burring. Backed by the latest technology and functional support, these machines are designed to provide for the need of portability as well as easy installation, thus making these the preferred choice of client companies. The advanced functional support provided by these machines also allows for achieving a faster solution to in-hand de-burring/finishing requirements of workpieces. Here, we offer the system with the support of variable speed drive as well as the option of running on a different voltage. 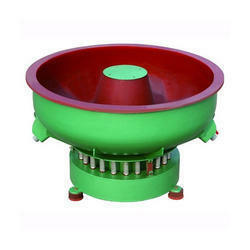 These vibratory finishers come with a weight mounted inside centre section of the bowl that provides for spiral vibration action which in turn results in achieving deburr and clean parts. The different media choices these can work on include plastic, ceramic, aluminium oxide, metal. Paint Coated Vibro Finishing Machine are mass finishing machines, used for deburring, polishing, descaling, and surface improvement on metal and plastic components. The machine has a steel bowl lined with rubber or polyurethane which is filled up with required media (either ceramic, plastic, maize etc. depending upon the finish required) and components. Eccentric weights are mounted on an extended shaft attached to a heavy duty motor to cause vibrations and create a spiral of the media and the components. Variations in vibration, achieved by varying weights and angles, and a suitable combination of media enable the machine to be used for different components. We are one of the leading manufacturers and exporters of a superior quality Metal Finishing Machine to our clients. These Vibratory Deburring Machines are widely used in various manufacturing industries for providing the perfect finish to components and parts. 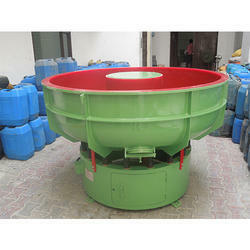 This machine is fabricated using premium quality materials and according to international quality standards. Our range is widely appreciated for their durability, optimum performance and excellent service. Clients can avail our range at affordable prices in the industry. Metal Polishing Finishing Machine is specially designed in PU PBR rubber lining having three component machine vibration vertical, horizontal vertical, which can be tuned independently to suit any specific job to optimum finish part. The component to be deburred, finished are loaded into the bowl along with a specific proportion of media, water, and finishing compound. The finish depends on the type and size of media, type and computation of chemical, vibration pattern set etc. and cycle time given. Surface Finishing Machine is especially intended for Deburring and finishing metal component, in order to remove drawl from Sharp Corners, Unbalanced Perimeters and Opening Edges without damaging of the metal surface. This Finishing Machinery is available with the multi-station and upper side brushing connection with brush fluctuation. These Finishing Types of machinery are designed to suit individual customer application as well as satisfy the requirements of clientele.